An update. 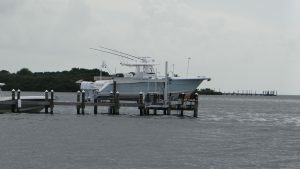 We arrived in the Jolly Roger RV Resort on the Tuesday, to find that Wednesday and Thursday were Mini Lobster Season. 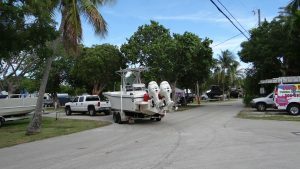 As I said in my previous this amounts to loads of people coming down here with boats and basically a free for all on Florida Spiny lobsters. 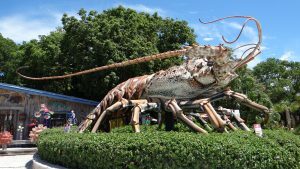 To quote another site “Every July the coastal areas of Florida are flooded with lobster hunters trying to get their share of this year’s bounty when the offical mini lobster season kicks off. 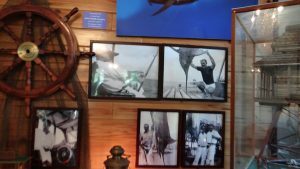 There are two Florida Lobster Seasons, the 2 day mini season and the 8 month regular lobster season. The mini lobster season is always the last consecutive Wednesday and Thursday in July. This year the mini season falls on July 26th and 27th. The regular 8 month lobster season is always August 6 through March 31.”. There is an interesting web site that tells you how to catch them, measure them, quotas etc. 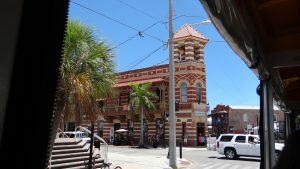 here http://floridalobstering.com/ . 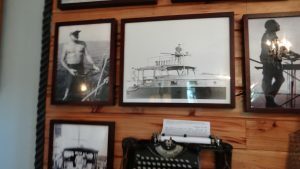 We decided to keep well away, plus the two gentleman next door to us promised to show us the lobsters and the end bit of the process the lobster tails (they do not seem to eat anything else but the tails). So Wednesday we decided as we both got up late to chill after the journey and just do some local shopping for food etc. as on the Tuesday night we had a nice meal at the http://flkeyssteakandlobster.com/welcome/ Steak and Lobster Grill. 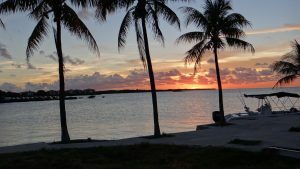 So Thursday dawned and we had decided to go to Key West, which is another 60 miles south of Marathon Key. Wow what a journey, Key after Key and bridge after bridge, including one that is 7 miles long. 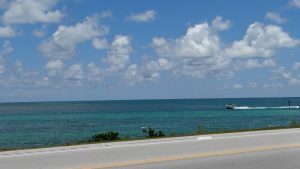 And then we arrived at Key West a key 2 miles wide by 4 miles long, by Keys standard a large key!! Immediate problem was to find the Trolley Bus tour start point and then some parking, which we found about 400 yds away for $20 all day. That 400 yds walk back in the Florida heat felt like 2 miles!! Got our tickets valid for 2 days, which was lucky as we thought we only needed 1 day, how wrong can you be!! Took the tour which took about 90 minutes and quickly realised that 1 day was not enough to see everything!!. So we picked a few things to do and started off. 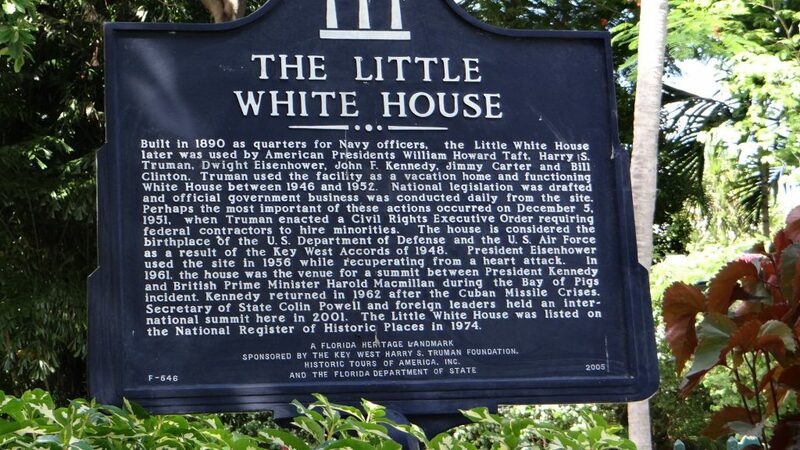 Number 1 was the The Little White House. I will let a photo explain this. It was used mainly by Harry S Trueman between 1946 and 1952 as an official White House when he was on holiday (vacation in the USA). Many influential pieces of legislation were drafted here and our guide told a lot of what went on when he was in residence. Most of it seems to involve entertaining and playing poker as well as working hard. 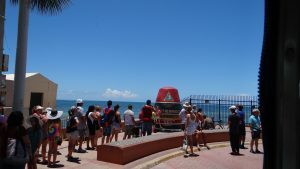 I have attached a few photos of our tour on the trolley bus but there are as you could probably guess hundreds of them. 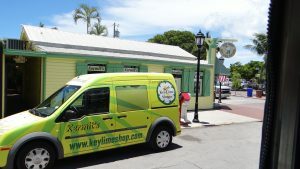 Key Lime Pie shop. 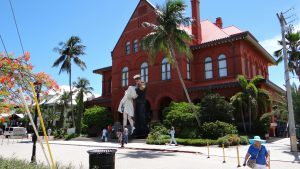 Iconic Naval station statue!! Southernmost point. 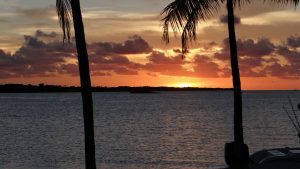 We then left and made our way back to Marathon where we saw a Florida Keys sunset !! 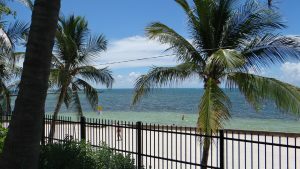 Next day we went back to Key West to make use of our two day pass. As luck would have it I decided to try the southern route to the Trolley place and recognised a car park that was on the route and FREE!! 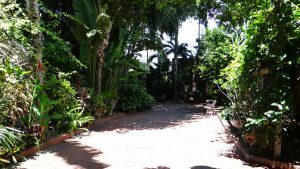 It was right next to the West Martello Tower which is run by the Key West Garden Club, http://www.keywestgardenclub.com/ . 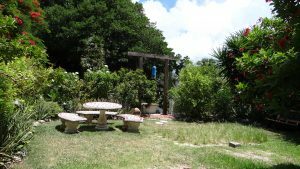 It is a lovely tranquil garden that includes a butterfly garden. 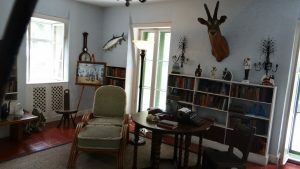 We then hopped on the Trolley and got of at Ernest Hemmingway’s house. We lucked out again and got another really good guide around the house, which took about an hour. Very interesting person, raconteur, drinker, writer, married 4 times!! 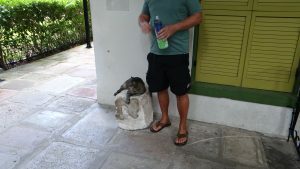 Lots of cats that are the 6 toed variety, which are fed by the guides. 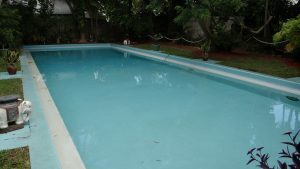 Swimming pool cost $20,000 in 1939. Today (Saturday) we went North, but unfortunately so was everyone else (leaving after mini Lobster Season), so it was extremely slow. 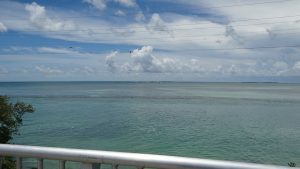 We were trying to get to Key Largo but in the end after 2 hours gave up at a place we had seen on the way down with a huge lobster model in the front, and a load of gift shops etc. behind. Bet you can’t eat that lobster tail. 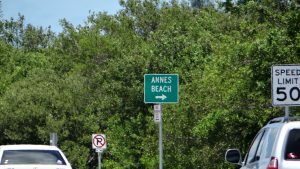 We also found that Anne has a beach named after her. As with everywhere here loads of sandy beaches, and miles and miles of clear blue sea. 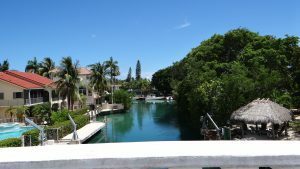 And we also found a place called Duck Key with an internal canal system and lots of nice looking houses that range from $420,000 upwards!! Tomorrow Sunday is a chill day, to get everything set up for leaving Monday (where is the time going!!). But more of that in my next post. A few days to catch up on. It has been a few days since my last post, so here goes. Christopher kept his promise and came and saw us on Saturday after his bike ride. He rode most of it with the sole of his cycling shoe gradually becoming more and more detached. He stayed for an hour or two and then went off to finish his gardening jobs. 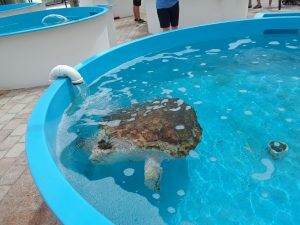 We then went out to see two local attractions, the Loggerhead sanctuary and the Hobe Sound National Wildlife refuge. The Loggerhead Sanctuary was very interesting with examples of the various turtles found in the Florida region and also some that are not, but it made a very good exhibit, especially the skeleton of an absolutely huge turtle they found which must have been at least 10ft from head to toe (or back end of shell). 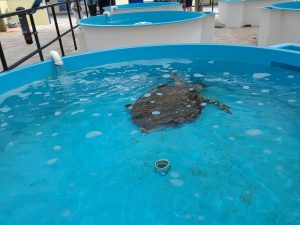 Outside they had various turtles recovering in tanks, a bit like the Seal Sanctuary at Gweek in Cornwall. 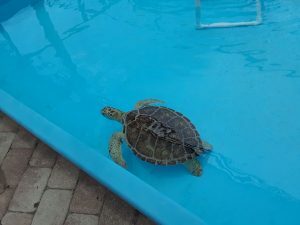 Most of them seem to have been found after being hit by boats or ingesting fishing line (not good for turtles as messes up their digestive system). A little one that kept trying to get out!! Another big one with seaweed on his head, like a comb over!! Best photo of medium size one. 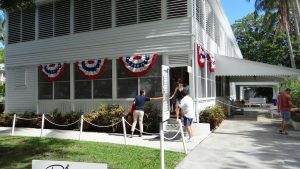 Unfortunately the main exhibit at the Hobe Sound National Wildlife refuge was closed (seems strange to close at 3pm on a Saturday!!). 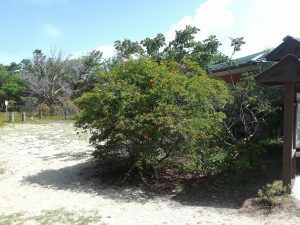 However, there was this bush that was covered in yellow butterflies, but I am afraid they don’t come out very well on the phones camera. You can just make out some yellow blobs if you look hard. Since it was very hot we decided to give the open air nature trail of two miles a miss and returned back so that I could cook the steak we had bought (steak is so cheap in the US). Next day dawned (Sunday) and it was a bit cooler so put the RV mat out, plus the table and chairs and we sat outside and ate breakfast and relaxed. There was a lovely cool breeze and it great to sit outside. Anne enjoying the cool breeze. 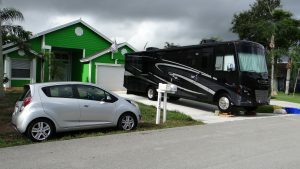 Notice the matching the paintwork all weather RV mat!! Also the wheels are covered in the wheel protectors. 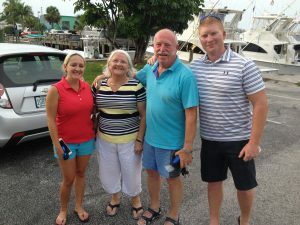 Later on Christopher brought Scott and Erika, who we first met at Christopher’s and Lilia’s wedding in Mexico, across to see the RV and after a beer we went out to eat at Shrimpers at Hobe Sound. 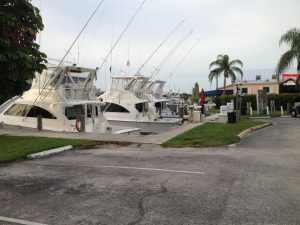 Each boat is worth $.5m apparently!! Monday saw me doing various things to the RV. Fixed the windscreen wipers that were set too low and banging on the bodywork. Bought LED stop/night/indicator lights for the back light clusters so everyone knew what I was doing, so I fitted those. 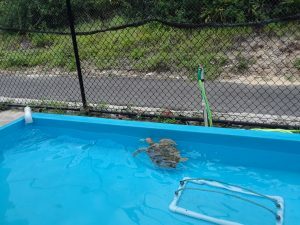 Also had to part empty the grey tank as we had a few showers since we had been here and it was full. And at the end of the day Christopher turned up with the propane hose that allowed me to connect the Weber grill to our propane tank, and we tried it out by grilling steak for dinner. We said goodbye to him later on as this was the last time we would see him before setting off to the Florida Keys (or perhaps that should be Quays!!). Tuesday dawned and for once we got up early as we had a lot of packing up to do before we headed off. 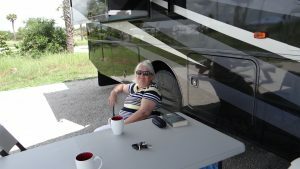 All the various things inside the RV had to be stowed so they wouldn’t crash about and break, the black and grey tanks had to be emptied and flushed, and the electricity, water and sewer pipe disconnected. Then slides in, jacks up and roll forward so we could attach the Spark to the towing hitch. and off we went at about 10.30am. First stop was to get some gas (petrol) and much to my surprise as it was reading half full it only took $80 to fill it up. 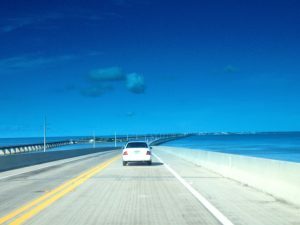 Then off to I95 for the journey south to the Keys. 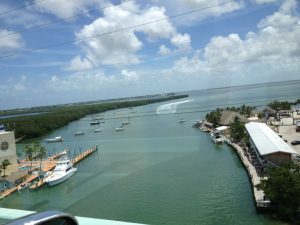 As it was after rush hour we got past Miami fairly easily and joined US 1 to take us to the Keys. One thing we have to figure out, is where do you stop in an 35ft RV with a tow car to have a “rest” break. US highways are sadly lacking in Service Areas no wonder they invented the various “pee in a bottle” solutions. In the end I just pulled it into a chevron area off the main carriageway so we could both go to the loo!! Then the Keys made an appearance. With lack of space US 1 in many places is just a single carriageway road with a concrete divider which had lots of rubber marks on it so obviously people have hit it. 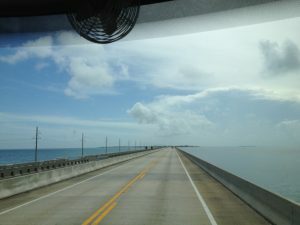 Some of the scenery is spectacular with long bridges over stretches of water (True Lies!!) and some larger bridges over deep water channels. Arriving at Jolly Roger 197 miles later. Site is a lot more cramped than JD Park, but then they do not have the space, and there are a lot of people here for the Mini Lobster Season (two days of mayhem apparently when everyone is out in their boats catching lobsters). Just about got the slides out. 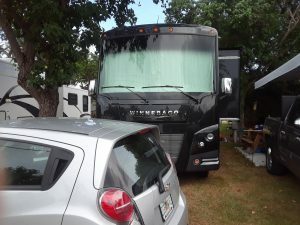 Tested my reversing skills getting between our camp area (concrete pad with table) and the large truck next door, but my guide helped, waving away in the mirrors!!). 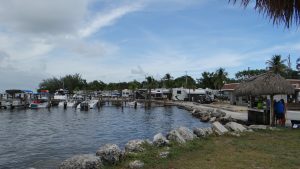 So we are here and planning our next 6 days going up and down the Keys as Marathon Key, where we are, is right in the middle. We need a bigger boat!! How about this one!! Woke up on our first morning and we both agreed the Queen bed is b****y hard!! So straight on the shopping list was a mattress topper we had seen but decided to wait until we had tried it out!! Then I tried out the shower, water flow was just about acceptable, but Anne then tried and said that the flow wasn’t enough to wash her hair properly. Well I figured it was the water pump, so I looked at the manual and discovered I had made a mistake. To be honest it was our previous experience of RVing in Canada that caused me to make the mistake. The RV we hired in Canada had a campground water connection, but we weren’t allowed to use it, just the gravity water tank fill and the on-board pump as apparently they had too many hire RVs blowing up water systems with over pressurised mains feeds. Well this “big beast” has a water pressure reducer fitted (keeps it at 40psi max which is what the water system is rated at) and that keeps over pressurised systems in check and allows you to run direct water pressure from the campground with no water pump in use. You only use the water pump when boon docking (camping on the open road or a Walmart car park, yes they allow it!!). So off went the pump and bingo good pressure throughout the coach except (you guessed it) the shower!! So the next culprit was the shower head. Disconnected it and sure enough the water from the hose was flowing nicely, so what is wrong with shower head? Perhaps it was blocked but on taking it apart all was well. And then I happened to look at the bit that screwed into the pipe and what I saw was a plastic insert with 3 minute holes in it. Great thought I a pressure reducer. No chance this was stuck in as permanent fixture and I can only think it is to help the feed when we are running on the pump. So the next item on the shopping list was a proper shower head!! (Update new shower head is a success). Next I went outside to fit the wheel covers. Now some off you at this point will be thinking has he gone nuts putting covers on the tyres and wheels, but there is a reason for this. 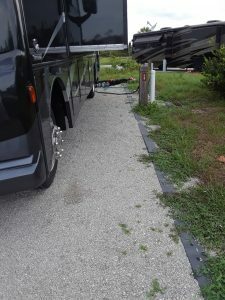 The Florida sun is quite hot (British understatement) and has a high (actually very high) UV reading, and UV light does nasty things to large RV tyres(truck tyres really), like cracking sidewalls causing blowouts. With two new tyres on the front and 4 fairly new tyres on the back axle I wasn’t taking any chances so on went the covers. Just in time as it happened, as a huge thunderstorm then rolled in and deluged us for an hour. Thunder and lightening in an RV is an experience, as is heavy rain bouncing off the roof, but at least it proved we have no leaks. After this we spent the afternoon in Walmart and Publix getting our food supplies in as the fridge is now down to the correct temperature and the ice maker is making big chunks of ice!! When we got back we cooked our first meal in the RV which was an interesting experience but with the vent fan, the cooker vent fan and the air con running we have no lasting smells and it stayed quite cool. Christopher is arriving early tomorrow as he is mountain biking in the park track for an hour or so. Not too early I hope, as we are retirees after all. So now to test the new mattress topper. 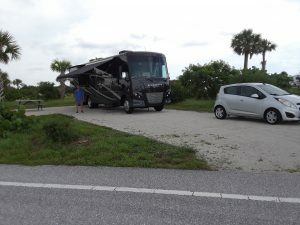 Well here we are after all the work buying the RV and tow car, plus contents, parked at our first Campground https://www.floridastateparks.org/park/Jonathan-Dickinson . 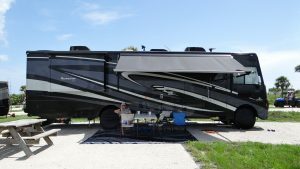 It is about 10miles up the road from Christopher’s and about 20 miles from Palm Beach RV just in case anything is not working correctly. After a very hot morning spent sanitising the drinking water tank outside Christopher’s house we loaded the last bits into the RV and hitched up the Spark. Then we set off to arrive at the park at 3pm which was our “check in” time!! After filling out a few extra details with the rangers we got two vehicle passes, one for us and one for Christopher so he could see an RV in the “wild”. We are on pitch 58 for 5 nights, to do the planned RV “shakedown”, getting used to how everything works, and making sure it all works as it should. While we were at Christopher’s parked up without the jacks out so not level, the fridge decided to throw a wobbly, but it turns out his drive was too steep and the fridge stops working if it is more than 6 degrees out of level. Anne found that out after searching the owners manual, so it was a case of RTFM. We parked up, levelled out on the hydraulic jacks (the RV dances for about 3-4 minutes until it is satisfied the RV is level), slid the two slides out, attached the surge protection system and the 50amp lead to the electricity supply, attached the water hose to the potable (drinking water to you and me) water supply and filled our fresh water tank, and then put the sewer hose together and attached it to the sewer outlet and the black/grey tank dump valves. All done without a hitch!! If you look closely at the photo above the first black lead is the 50amp electricity feed, the just visible blue hose is the fresh water feed and the brown hose on the black caterpillar (contraption to allow a gradual fall on the pipe to the outlet so nothing yucky gets stuck in the pipe) is the sewer connection. We then went to get something to eat and some basic supplies (not to many as the fridge is not at the right temperature for at least 12 hours) and then returned in another thunderstorm. Florida weather is almost as changeable as the weather in the UK!! Christopher then came to see us and to check out the RV life style. First thing he said was it is quiet here and it is until an Air Con unit kicks in!! Sitting a nice balmy 77F (25C) as we have been told not to make it too cool as the hot air hits you as you leave. Leave!! I am staying in here!! I am typing this in the RV using the AT&T phone as hotspot as there is no WiFi in State Parks. Tomorrow we will go and get more groceries and start using all the appliances in the RV. Subscribe to the blog to receive email every time it is updated. Got to the bottom of the subscribe feature. Once you have the blog showing in your browser, scroll down and you will see the area entitled Recent Posts. Click on any one of the recent posts and the post will come up and at the top after the first paragraph you will see the Receive Updates form. Fill out your email address in the box next to Receive Updates and click on Sign Up. The system will send you an activation email with a link in it. 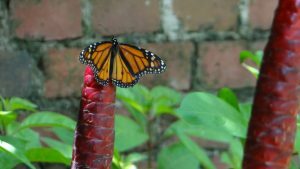 Click on that link and as they say in America “you are good to go” and you will receive an email every time I update the blog. 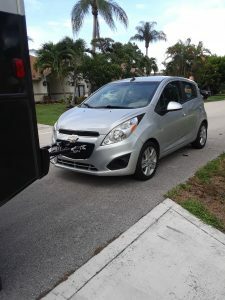 We decided as the Spark was going to be our lifeline that we ought to get it serviced, so I phoned up the local Chevy dealer and booked it in for a full service, saying that I would wait while it was done (little did I know!!). The day (Friday) dawned and I turned up at Schumacher’s and was introduced to my “service Consultant”, Tom!! He noted what was required including fitting the “hood” bracket so the hood would stay up (for some reason it was missing) and two extra keys. He then said they would take a look at it and let me know approximate costs!! In the meantime I could sit in the Customer Lounge and enjoy the free coffee and bagels. Had a coffee, gave the bagels a miss, although not everyone did as while I sat there an older lady came in and proceeded to take three complete bagels with cream cheese and wrap them up and put them in her handbag, must have been peckish!! Anyway an hour later Tom turned up. The Spark’s rear drum brake cylinders both had leaking seals, which had ruined the cylinders so both needed replacing including the brake pipes which were frayed, and we needed new front brake pads on the disk brakes. Other than that and the normal filters and oil, and he advised a transmission oil change as it was long overdue, he said the car was in remarkably “good shape” especially as the last time he could see it had been serviced was 25,000 miles (40,000 miles ago!!). All of this meant they had to order parts and it therefore would not be ready until Monday!! They would supply a free loan car. OK said I and we duly filled out the paperwork, and I was taken out to the loan car. Well I had to laugh!! Here was me driving around in England in 14 year old Passat estate with 220,000 miles on the clock and running the UKPassats web site http://www.ukpassats.co.uk/phpbb/index.php and the loan car was a nearly brand new VW Passat sedan (saloon) with 3,000 miles on the clock and all the toys!! And I had it for the weekend!! I had also arranged on Friday for the paint guy at Palm Beach RV to fit the new bumper, so I had to ring him and rearrange it for Monday when the new tyres were due to be fitted to the RV. We had a good weekend shopping for the RV and chilling as well as trying out the Passat (it was a V6 3.2 litre!!). Monday dawned and it was due to be a busy day. Pick up the Spark from having a service at the Chevy dealer (and return the loaner VW Passat sedan sigh!! 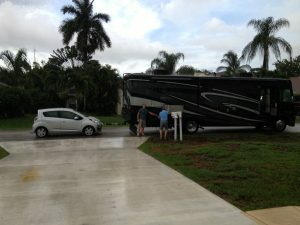 ), back to Christopher’s, hitch up the spark to the RV, drive to Palm Beach RV (slowly with the tyres banging away!! ), leave it to get the tyres done, and take the Spark to the paint shop to get the new bumper fitted. What is that saying “the best laid plans of mice and men”!! Waited for the supposedly early call to say the Spark was ready, but by 10 o’clock it hadn’t happened, so I rang the dealer. The Spark wasn’t going to be ready until 11.30am at the earliest as some parts had come in late. So I rang Palm Beach RV to warn them I was going to be late, to be told that the tyre place they used were short of fitters as they had called in sick so could we delay it until Tuesday!! OK that simplified things a bit as now I had to just concentrate on the Spark. Schumacher’s phoned back dead on 11.30am to say the Spark was ready, so I set off. Saw the Spark sat there ready when I pulled in and Tom said could I complete the loaner paperwork and he would get my bill ready. Completed the paperwork, and went to Tom’s booth. Turned out the bill was slightly less than the initial estimate, but it was still a chunk of money!! 2 keys at $128 each didn’t help as well as an hour’s labour to fit the hood strut bracket (think it would have taken me 2 minutes!!). But it is all worth it as the car was now on a “minor” service schedule and wouldn’t need another service for 5,000 miles. So got into the Spark and drove it to the paint shop. At least that part went well, all fitted in about 2 hours (they had to recut the new grill to allow the tow receivers to fit through). I then drove back to Christopher’s in a Florida rain storm (it hissed it down for at least 2 hours, but over here they seem used to it with large drainage ditches and huge runoff drains on the roads). Tuesday dawned and it was time to take the RV back to Palm Beach RV to get the tyres fitted and some paperwork done for the extended Warranty etc. After a slow drive down, so we didn’t break anything in the partially loaded RV with tyres banging away, we arrived at Palm Beach RV. They have a somewhat narrow entrance to the lot so turning in from the middle lane of the main road was an experience as Americans have a habit of undertaking people even when they have the right turn indicator flashing (thank god for the camera in the mirror, so I had at least 3 ways of checking what was happening)!! Made it into the lot and handed the keys over and they took it off to the Tyre supplier. The estimate was 2 hours to change to RV tyres, so we should be out of here by 12.30 (!!). Completed all the paperwork and then sat and waited for the RV. 12.30 passed, still no news, and finally at 1.00pm I went and asked if they had heard anything. That rang the tyre fitter and they said it would be ready in about 30 minutes. Well it was actually an hour, before we were driven up there to collect “big beast”. All done, with the Tyre Pressure Monitoring System installed on the new tyres. “RV is round the back in our lot” says the receptionist as she gave me the keys. Well that tested my manoeuvring skills in a 35ft RV. It was parked front in with cars all around it and not a huge space to turn around!! Finally got out after a 10 point turn, without hitting anything (the rear camera is a godsend!!). 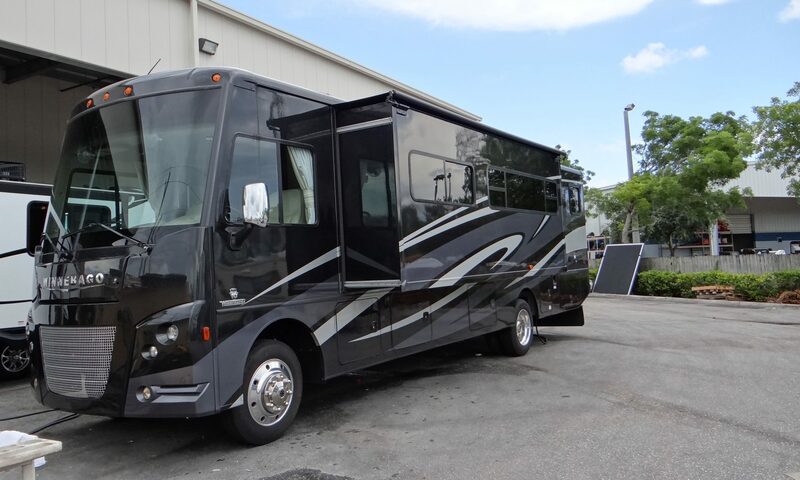 We had agreed with Palm Beach RV we would test drive it up I95 to Christopher’s and we would let them know the result. Well all I can say is what a difference two tyres make!! Smooth as silk, no banging and cruised at 55mph no problem, so that sorted that out. Got back to Christopher’s and Anne made the evening meal (sockeye salmon very nice) and the Christopher and I decided to try out towing the Spark. 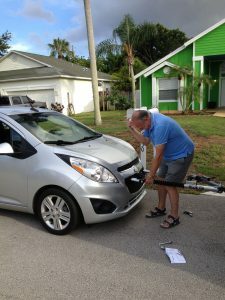 Hooking it up was fairly easy and it was at this point that Christopher insisted Anne drive the Spark while I did the hitch work, so for the first time since we arrived in the US Anne drove a car!! It all went very well and Christopher and I set off on a trial run. 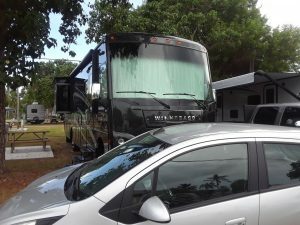 The people at Palm Beach RV said we wouldn’t even notice a 2,000lb car being towed by a 22,000lb RV and that turned out to be true, and the only reason we knew it was there is we could see it in the rear view camera. 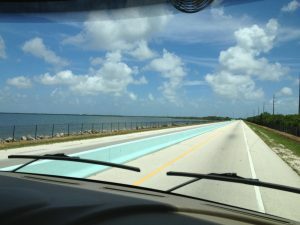 Christopher decided he needed to test my RV driving skills on narrow roads (for America that is, although they are still wider than a lot of our A roads), and roundabouts (there seem to be a lot in Florida compared to other states I have been in). So after about 10-15 miles and about 10 roundabouts all negotiated with the rain tipping it down, Christopher was happy and asked if he could have a drive. He took us back to his house and luckily it had stopped raining (or so we thought) but as we unhitched the Spark the heavens opened again and we got soaked, but at least it was warm!! 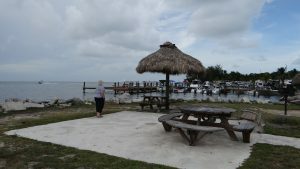 Sorry this is along post, but there was lot to tell, but mission accomplished all vehicles ready to go and we are now booked into the shakedown campground, Jonathan Dickinson State Park from Thursday night for 5 nights to trial everything on the RV https://www.floridastateparks.org/park/Jonathan-Dickinson . Final note, I am trying to add a subscribe widget to the Blog so that you can be informed automatically if there is a new post or comment. Think I have done it but not sure as I only seem to see it at certain times. Let me know by email if you are having problems. Anne in the driving seat. 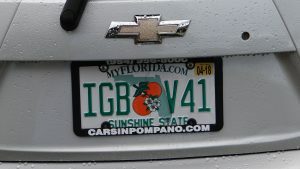 Spark Florida plate turned up. We got our first official number plate today for the Chevy Spark, and I think someone at the vehicle licensing has a sense of humour, can’t believe it is a coincidence!! Well it finally happened we picked up the RV!! 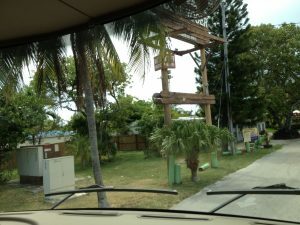 Got to Palm Beach RV a little early and we sorted out a couple of payments for some outstanding items, and then we set off on a test drive and lesson on driving. All went well, learnt how to avoid overhanging trees (it is 12ft 6in tall) and that doing a U turn in an RV of this length is not possible (just go around the block!!). Got to remember the rear end swings out as at least 9ft of the coach is beyond the rear wheels!! It was then we noticed a vibration from the front wheel, but more of that later. Got all that sorted out and then returned to Palm Baech Rv to find that they still hadn’t emptied the black/grey tanks, or filled up the LPG and gas tank. So they emptied the tanks, went to AmeriGas to fill up the LPG tank and then to Racetrack garage to fill up the gas(petrol) tank. Filling the gas tank was an experience vying with all the other people to get a 35ft bus alongside a pump, but eventually got there. You also can only go to the larger garages as you have to get a 12ft 6in bus under the canopy!! Then we started to fill and fill and fill the tank. Bear in mind it was just under half full when we started, but about 5 minutes later the pump final slowed and clicked off and we had a full tank and 45 gallons extra (US fuel pumps seem to go extremely slowly but luckily they have this nifty catch that allows the pump to carry on working without you having to hold it). Total bill $99 at $2.09 per gallon, which is 3 .78 litres approximately (that is about 45p per litre!!). I have seen it lower that at $1.99 so thank god for low prices!! All done so we drive back to Christopher’s to drop of the Spark and then he drove us back to Palm Beach RV to finally drive the RV to Christopher’s. We had already mentioned the vibration and they said they would arrange a tech, but I am glad we did as on the drive back up I95 we couldn’t get above 50mph because the vibration got horrendous. Christopher pulled alongside on I95 and he could see the wheel was bouncing, so we backed off to 45mph and drove home. We then looked at the tyres (tires in the US!!) and the nearside had multiple flat spots and the offside had a few less but still had some. So I am back to Palm Beach to tell them we need 2 new front tyres and I am not paying for them ($450 a tyre!!). We got the RV on the drive and with Christopher’s help and a lot of wooden blocks we got “big beast” (as Anne calls it) level on the auto hydraulic levelling system, so we could run the bedroom and living room slides out. We were hoping to use one of the house 30amp sockets to power the static RV but its not that simple in the US as the house sockets seem to have a different configuration to the RV 30 and 50amp sockets, another thing to ask. So day ended with us running the RV on the generator, which since it has only got 94 hours use on it is no big deal. Only a few wooden blocks. On a level site we shouldn’t have to use any. “little beast” and “big beast” !! Today we are starting to put all the “stuff” we have bought into the RV and figure out what we still need and I am back to Palm Beach RV to get the Spark front bumper sorted and tell them about the tyres!! Onwards and upwards!! In spite of all this we are way ahead of where we expected to be, so hopefully we will be going to our first “shake down” RV campground next week. I have forgotten to mention one important part of our journey so far and that has been the transfer of money to our US bank account with Citibank. Some months ago I spotted an article by Martin Lewis of Money Saving Expert about the rip off rates that Banks use to transfer money to foreign banks. Investigated this with our bank and found that on average you lost about 6-7 cents per pound when transferring money to the US. 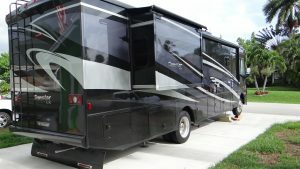 Now this meant we would lose quite a substantial amount when we wanted to move money to buy our RV. Martin in this article http://www.moneysavingexpert.com/banking/foreign-currency-exchange recommended a company called Transferwise. I can but back him up on this as we have used them and to say the least the transactions have been flawless. Because our bank had a daily transfer limit we had to do it over a few days but having two bank accounts with different UK banks sped up the process. The way is works is you transfer money to Transferwise (we did a small transaction of £100 first to check it all worked), and then Transferwise converts the money and sends it to your nominated foreign account. It works for all of the major currencies and they are gradually adding more. We always got the top conversion rate as per the market (we lucked out as over the period we did it £ – $ went up to $1.30!!) and Transferwise make their money by taking a small percentage fee on each transaction. We actually saved thousands of dollars by doing this, so I can heartily recommend Transferwise. Thursday the 6th July dawned and with some trepidation we set of to Palm Beach RV for our training course and to pick up the RV and the Spark with the towing hitch fitted. Got there after picking up a rather large certified cheque from Citibank and the day started with an introduction to their Finance guy to hand over the cheque and sort out our Warranty and Paint cover. All completed we waited for the guy who was going to walk us through the RV and introduce us on how to use everything. He turned up and first showed us the Spark with all the towing brackets etc. sticking through the front grill. At first glance all looked great(more of this later). Then onto the RV. I suppose we should of guessed that we weren’t going to get all we thought we were when he opened up by saying “this is my first time doing this on an RV”. Anne asked if we could video his talk and he said he wasn’t happy with that so Anne got the notebook out and started writing. First came the tour around the outside where we were shown the outdoor entertainment centre, the various storage lockers, the on-board generator and how to start it from the outside, and then the important bits on how to connect to the Black (sewerage), grey(dirty water) and white(drinking water) tanks, and the electrical, TV and cable hook-ups. First thing we found out was something we already knew but our guide didn’t was that there was a separate black tank for the front bathroom which was connected to the back black tank for dump purposes via a macerator pump. Got that sorted out and then moved on to the front of the vehicle, where he didn’t know how to open the hood (bonnet). Luckily I knew how to do this and had already seen all the important bits (oil fill, radiator top up, washer bottle etc. ), so we completed the external tour and moved inside. Opened up the door and out popped the steps and he took us through the 4 batteries on board (2 engine start, 2 house batteries for running unconnected to power). Next to them he pointed out the external awning controls, and then then the various fuses and breakers that were in the panel next to the switches. Then we introduced to the screen door and the main door locks etc. and finally got out of the Florida heat into the air conditioned interior!! This is when we discovered that the bits they were supposed to be repairing hadn’t been done! The end of the tow/haul lever was still missing, and the pull that opens the sofa into a bed that was pulled off during our sales tour was still off!! We proceed on round the coach (will not bore you with the multitude of switches, functions etc. 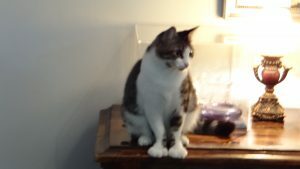 we were introduced to), although there was quite a few things that he was unclear about how they functioned. Finally got to the bottom of most things after asking more questions. I then noticed an extra pedal next to the automatic pedals and asked what it was and he said it was the parking brake and proceed to show us how it worked. He released the brake and at this point the levelling jacks all automatically closed, a safety feature he had forgotten all about, since you are not supposed to drive off down the road with jacks down!! After a bit of rocking and rolling as we settled onto the wheels he apologised and tried to explain what had happened!! We then moved onto how the slides worked and said that he would now show us how they retracted. 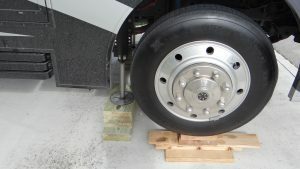 Now I was a bit puzzled by this and said so, since I had read that you should never move the slides unless the vehicle was level on the jacks, which due to his mistake were now closed. Luckily Winnebago had put another safety feature in that stops you operating the slides without being level, so when he pressed the button nothing happened!! So we found out how the levelling system worked!! First you must turn on the engine to provide pressure for the hydraulics and then you hit the Auto Level button. 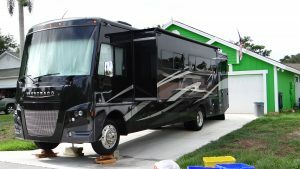 At this point the jacks come down and the RV goes into a sort of dance at it figures out what jack it needs to get the RV level. After about 3 minutes it declared success and sure enough we had one green light in the middle of the levelling system saying it was level. Then we could retract the slides!! Which we did by pressing the appropriate buttons, but noting that you must make sure you switch all the lights etc. off at the back of the RV as once the bedroom slide is in the only way to do it is to climb across the bed. At this point the “instructor” declared it was time for lunch and he would take us through how to attach the Spark to the hitch after lunch. Anne and I looked at each other and said fine we will go and get lunch as well and meet him back there in an hour. In reality we wanted time to write down what we thought was missing so far and what we still needed to know and get fixed. Our list was quite long so we decided after lunch to get our main contact Will and explain to him that we were not that happy with what had happened. 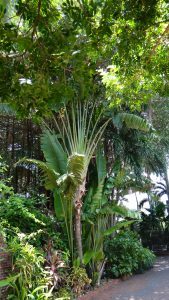 To give him credit all sorts of people appeared out of the woodwork and we suddenly had access to more experienced people who explained all the outstanding questions (i.e. how did the left/right turn cameras work, obvious when you shown but it was omitted!). Then we went through the things we thought we had paid for but not been done, black/grey tanks had not been emptied and flushed, LPG was not full, gas tank was half empty and supposed to be full and we weren’t too impressed with external “detailing” (water streaks all over it). So finally it was agreed that we would leave the RV with them until Wednesday 12th July so they had time to fix all of this and also service the vehicle/generator which had not been done. Ho hum. 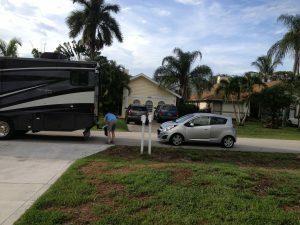 Then I was shown how to hitch the Spark up to the RV (it looks tiny at the back of the RV!! ), which to be honest was impressive with so many safety features to stop it flying off into the woods if it became disconnected!! 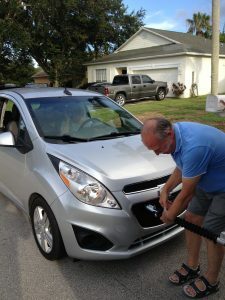 We needed the Spark as the hire car goes back on Sunday 9th and we had promised to take Lilia to Miami airport on Tuesday (going to Mexico) as Christopher starts his training course on Monday and cannot get away. So we parked it in the Customer Parking and drove back to Chris’s to get him so we could pick it up. 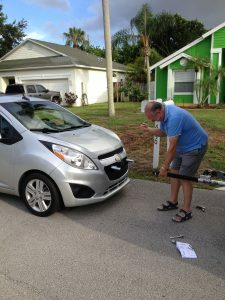 We then drove back with Chris and it was then that he noticed that they had damaged the Spark front bumper installing the hitch!! The dealership was closed so we drove back got something to eat, and called it a day. Next day we went back again to have this investigated and we are getting a new bumper to fix the problem!! Result!! Other than all above we have been continuing to shop for the RV which if some of you have seen Anne’s Facebook post has not exactly been my favourite bit!! That’s all for now, probably will leave it until Wednesday to post again when we pick up the RV (hopefully) ! !